The Tooshlights system uses sensors to alert waiting restroom visitors with a green light when a stall in unoccupied. The Hollywood Bowl has installed a green-red light system to help patrons avoid long lines at restrooms during show intermissions without having to guess whether a stall is available. The Tooshlights system uses a sensor that activates a green LED light in the ceiling above the stall when it's available. 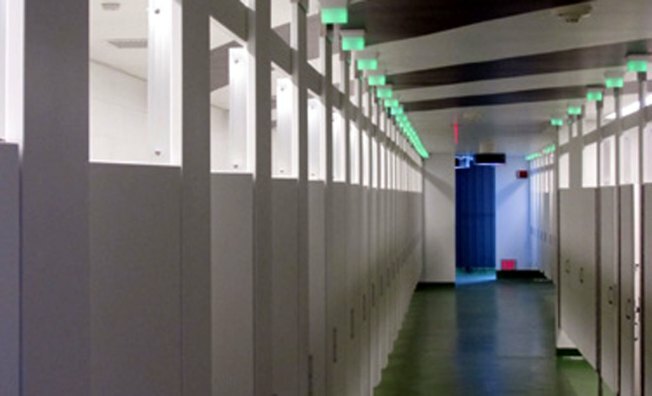 The system is designed to alert people waiting in line to an unoccupied stall and save them an uncomfortable knock or intrusive peek under the closed door to determine whether it's safe to enter. "We've all been there," said the Southern California-company's co-founder, Allen Klevens. "You peek through the crack in the door, knock, maybe cough." Tooshlights is similar to a parking stall system used at Santa Monica Place and other public parking garages. Sensors scan for cars and alert drivers with a green light when a stall is available. The Tooshlights sensor measures ceiling height to detect the presence of a person in the stall. Red means wait, green means it's ok for the next person in line to go. The idea started with a Hollywood Bowl patron -- one of many flush with frustration after standing in a restroom line. "They basically said someone needed to figure out something," said Klevens. "We started thinking about it on a broader scale and did some beta testing." And, a lot of field research -- asking people in long lines about their restroom wait times. "They were a lot of fun," said Klevens. "We just explained we're in the bathroom business. "People told us about all the time they wasted in line when they could be buying a beer or something else." The Bowl expects to have all restrooms equipped with the system -- the product launched in January -- in 2014. "Our patrons have definitely noticed the difference," said Hollywood Bowl Director of Operations Ed Tom. "There is no more standing in line waiting for stalls that are actually sitting unoccupied." A mobile app in the works is expected to be ready sometime next year. An audience member can check the app to see bathroom locations and stall status. Eventually, the service could expand to stadiums, convention halls and other locations that must have an answer when nature calls. The also company plans to create customized lights -- for example, venue logos or themes, such as football-shaped lights for a football stadiums.